She was a wonderful and very sweet girl. She loved to dance, watch Barney, Elmo and The Doodlebops. She was totally in love with her brothers, especially Landon. She followed him around everywhere. Melody grew up in White Pine and Jonesborough, TN during her short stay here with us on earth. Me, doing what I do best, PLAYING!! 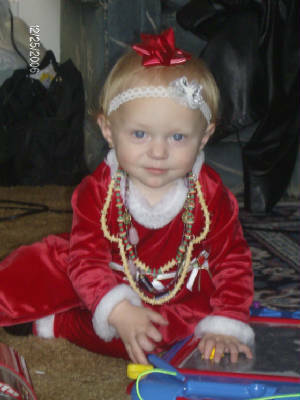 It's so hard being a toddler and modeling daddy's jewelry and letting mommy put Christmas bows on my head and take pictures! PHWEW!